Marks a birthday of sorts for the US-- And the real beginning of summer. The weekend closest to the fourth is holiday weekend. Here in NYC its been a broken one—Friday (and many start the week end by taking Friday off was OK. Saturday was predicted to be warm and sunny—well it was warm, but the sun played hide and seek behind big fluffy clouds—that got bigger, darker and denser as the day went on. Sunday I woke to the sounds of thunder—followed rapid by the sounds of rain. The initial storm moved on, but like the rain continued on and off all day. This AM the sky's are bright—but not a patch of blue to be found. The weather reports promise clear sky's in time for tonights firework—I hope so! I hope things a bit clearer in a few hours—Saturday there was a wine and cheese party at the pool—yesterday schedule was for races and games (perhaps some will be held today) and today is supposed to be an all American cook out. Burgers and franks, sun and fun. Meanwhile—I've been knitting. Not much—but bottle sock 1 (actually number 3—I knit 2 last year!) 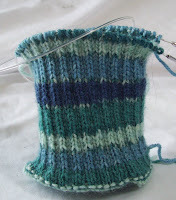 is done, and sock 2 (in blue) is half way done--it might be done tonight and gone! My friend Debbie—who last year started to knit with a spool knitter—and by September was knitting simple blocks for the YarnBombing project at the Makers Faire (in NYC) is now struggling with socks. Oh, what socks they will be. She is far from a perfectionist! It's fun to see her laissez fair attitude. But, to get back to the point—the blue bottle sock will be for her mother—who has reached that certain age, when a myriad of small problems –each one manageable on there own—have conspired to leave her a bit worse for wear. The drugs for the heart and blood pressure work fine—but the don't play well with the drugs used for the chemo and radiations (which seem to be working) but leave her exhausted. Now more than ever, keeping hydrated is an issue, and like me, she like cold water. Frozen bottle of water are too cold to touch—Tepid ones ones, are less likely to be drunk. There will be another one (bottle sock) and then some real socks, and then some sun hats. And who knows what after that?! 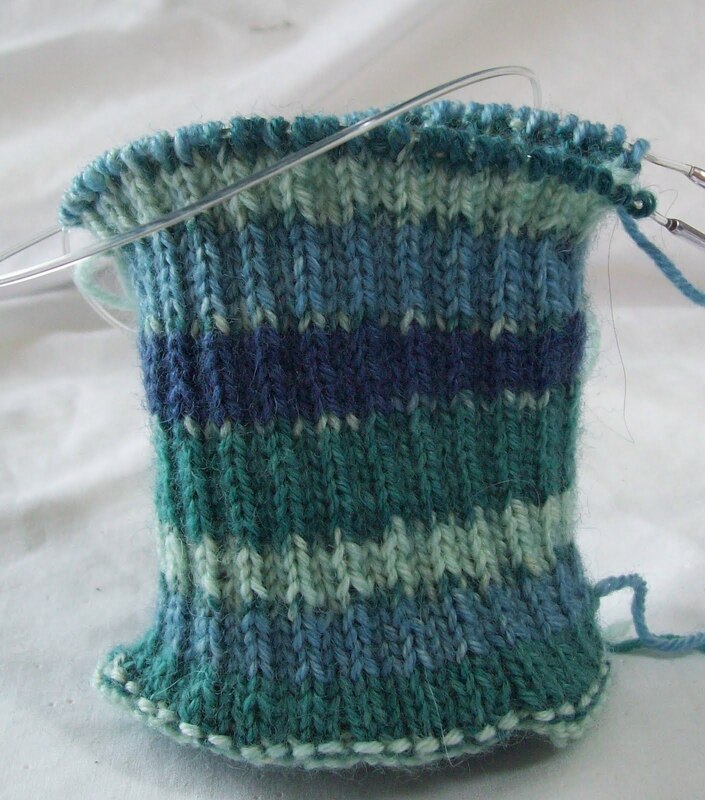 What size knitting needle would be used to make the "Bottle Sock"
Sports weight yarn and a size 3(3.12mm) would also work (you'd need few stitches--56 or 60 would be more than enough. I think the cover would be too bulky in worsted--but that's just my opinion.